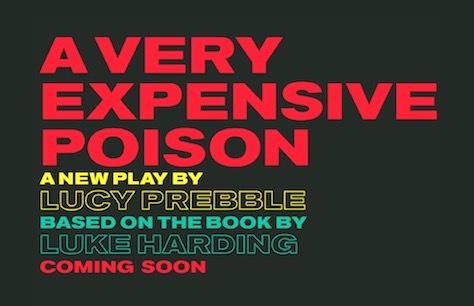 The world premiere of A Very Expensive Poison is set to open at the Old Vic in 2019. Award winning playwright and writer of the wildly popular series Secret Diary of a Call Girl Lucy Prebble’s tells of the assassination of Alexander Litvinenko. Based on Guardian journalist Luke Harding’s book of the same name, A Very Expensive Poison brings a world of whistle blowing, defection, espionage, revenge and politics to the stage. Alexander Litvinenko was a former officer of the Russian FSB and KGB who defected and became a naturalized British citizen. He worked as a writer, journalist and consultant for British Intelligence Services and was outspoken in his opposition to Vladimir Putin and his government, openly accusing them of staging bombings and other acts of terrorism to bring about Putin’s rise to power and orchestrating the murder of Russian journalists. In November of 2006, Litvinenko fell seriously ill and was hospitalized. He would never leave the confines of the hospital again. He died less than a month later, the first confirmed victim of polonium 210 induced acute radiation syndrome. Follow the twists and turns that prove that fact is often stranger than fiction. Further details about A Very Expensive Poison will be released in due course, keep an eye on our pages for the most up to date information.